I know this blog is a bit later than the first Friday, but I was asked to write a guest post for HoCoPoLitSo (Howard County Poetry and Literature Society) to mark LGBTQ History Month, and I wanted to let that post get published first there before I published a slightly different version of it here – so much has happened since I submitted the blog to them, and I kept thinking/writing. Now that it’s up there, here it is. You can also check it out on HoCoPoLitSo’s blog. October is LGBTQ History Month. When I think about LGBTQ history, I am of two minds and the poems included in the LGBTQ collection on Poets.org perfectly reflect that split. Some of the poems are so absolutely ordinary in their subjects, like the poem, “our happiness” by Eileen Miles, and on one hand, I think, that’s progress: the lives of LGBTQ people are written and expressed in the same way as other lives. That’s equality, right? Being a gay poet doesn’t mean that you have to write every poem about the experience of being gay. Not every aspect, every moment of my life is about that, but my experience is most definitely shaped by it and so is my view of history. If we’re really talking about history, the conversation is incomplete unless we acknowledge that nothing is really the same. Some might say, hey, you won the right to get married, so what are you complaining about? That reminds me of the poem, “On Marriage” by Marilyn Hacker where the poet talks about the way in which LGBTQ people “must choose, and choose, and choose / momently, daily” to affirm their commitment to one another, “Call it anything we want” when society doesn’t quite know how to accept or handle this kind of “covenant.” We talk a lot about “White Privilege” in cultural discourse, but we don’t talk a lot about “Mainstream Heterosexual Cisgender Privilege.” It exists. MHCP allows folks to do very ordinary things like hold hands in public without having to do a quick check of their surroundings. MHCP allows you to use whatever bathroom you want without being harassed or shamed or threatened. It allows you to feel “normal” out in the world. Put it this way: there are times when showing affection to my wife in public – just a peck on the cheek – feels like a dangerous political act. It hasn’t always been this way for me. In fact, I enjoyed MHCP for most of my life. I went to a conservative Christian high school, and though there were probably gay people around me (I’m pretty sure a few of my teachers were/are), since none of them were out, I feel as though I didn’t meet a gay person until I went to college. Riding through my high school years and my twenties as an MHCP was easy. Being white made it even easier. Realizing I was gay later in life when I care less what the world thinks has made the sting of discrimination sting a little less. Still, it was surprising to realize that the world had changed. Is it weird to say that I want to have it both ways? As Uncle Walt says, “Very well then I contradict myself, / I am large, I contain multitudes.” I want everyone in the world to see LGBTQ people as just normal, and I want everyone to know that our experience is different. “this woman is a lesbian, be careful. the water would run into their lungs. women, but nobody had taught us how to swim. 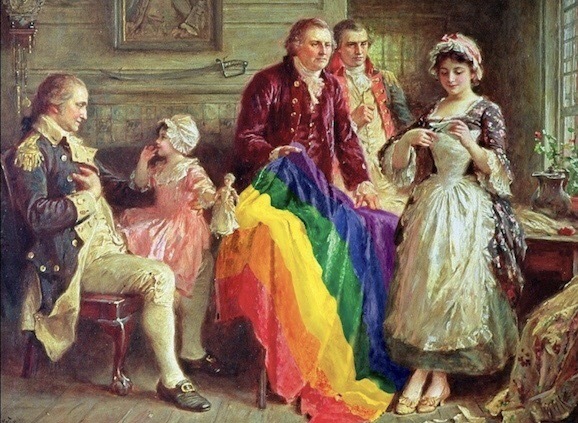 LGBTQ history is a history of fraught silence. A friend of mine, Rob, hid the fact that he was gay the entire time he was in the Navy – it wasn’t just that he feared for his job, he also feared for his life, that other soldiers might threaten or harass him for being openly gay. He hid it until he completed his tour of duty, and then he came out to all of his friends. You might think that passing a law abolishing “Don’t Ask, Don’t Tell” would end this discrimination, but you would be wrong. This discrimination still exists in the military – though now the target has shifted from being gay or lesbian to being transgender. Grahn’s poem was written in 1940; it is 77 years later, and we are not there yet. And because we live in the age of vindictive executive orders, we are too afraid that the next step in the movement will be a step backward. LGBTQ employees. For all the poems that are out there, some things about the LGBTQ experience just defy expression. Not everything is just about the right to get married or or what sports we can play or what bathroom we’re allowed to use – those things are important, but there are even heavier questions on our minds than whether you see us as equal – like whether you see us as human. We’ve seen in the last week or so of our history that LGBTQ youth are not safe on college campuses around the country. At Cleveland State University in Cleveland, Ohio, flyers have appeared encouraging LGBTQ students to commit suicide, taunting them with the statistics that mock the loneliness and desperation that LGBTQ people feel with the disgusting tag “Fascist Solutions.” There is no poem that expresses what I want to say to the monsters that distributed these flyers. There is no poem that says want I want to say to Donald Trump and Steve Bannon and Richard Spencer, the men who have given these monsters a voice in our society. This history is so raw, so painful, so new. Current events are going to write these poems, and I want to read those poems too, not just the ones that try to normalize our experience. that, you’d think that we are living in a new era, but in reality, it isn’t quite true. We are living in a time that feels, in some ways, more dangerous than ever. In “Love Song for Love Songs,” Rafael Campo writes that it is “A golden age of love songs and we still / can’t get it right.” That’s what I think: If we’re going to talk about LGBTQ history and celebrate equality, we have to admit that, despite so much progress in the last few years, the last ten months have shown us that we still have so far to go. Sharpen your pencils. Ryna, Thank you for sharing this. Excellent piece. Worth discussing some of the issues you raised when we get together. You may be interested in the response of an old-timer civil rights worker. I’ve been watching the series….miss the Yankees.